Monolayer contact doping (MLCD) is a modification of the monolayer doping (MLD) technique that involves monolayer formation of a dopant-containing adsorbate on a source substrate. This source substrate is subsequently brought into contact with the target substrate, upon which the dopant is driven into the target substrate by thermal annealing. 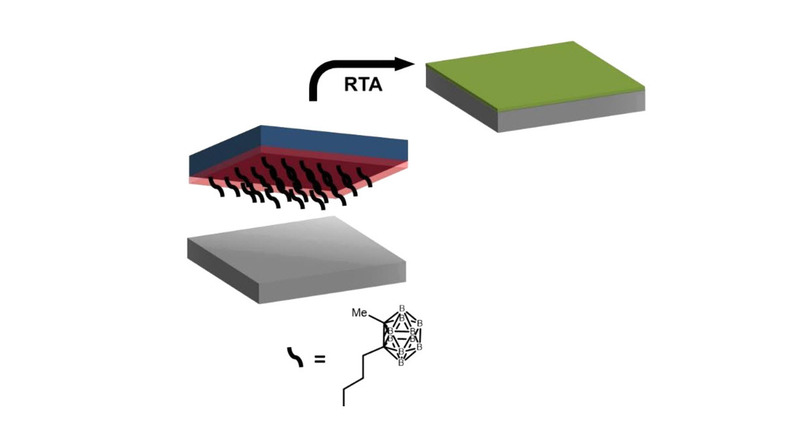 Here, we report a modified MLCD process, in which we replace the commonly used Si source substrate by a thermally oxidized substrate with a 100 nm thick silicon oxide layer, functionalized with a monolayer of a dopant-containing silane. The thermal oxide potentially provides a better capping effect and effectively prevents the dopants from diffusing back into the source substrate. The use of easily accessible and processable silane monolayers provides access to a general and modifiable process for the introduction of dopants on the source substrate. As a proof of concept, a boron-rich carboranyl-alkoxysilane was used here to construct the monolayer that delivers the dopant, to boost the doping level in the target substrate. X-ray photoelectron spectroscopy (XPS) showed a successful grafting of the dopant adsorbate onto the SiO2 surface. The achieved doping levels after thermal annealing were similar to the doping levels acessible by MLD as demonstrated by secondary ion mass spectrometry measurements. The method shows good prospects, e.g. for use in the doping of Si nanostructures.